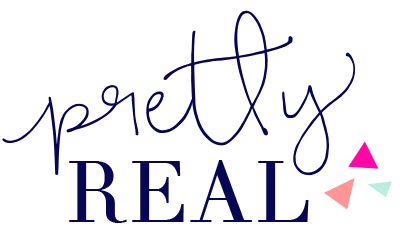 I'm glad the blog was renamed Pretty Real. It's a constant reminder to share the bad with the good--the real with the pretty. Things are coming along and while I'm tempted to say 'slowly,' we've been in our home for less than 2 months. I've yet to share any photos of the house (other than the playroom) and it's because I don't want to share it in its imperfect state. But that's where the 'real' comes in. I've had a few ask for pictures so here goes. Almost our entire first floor is one big room. When I said I wanted 'open concept' I wasn't kidding. 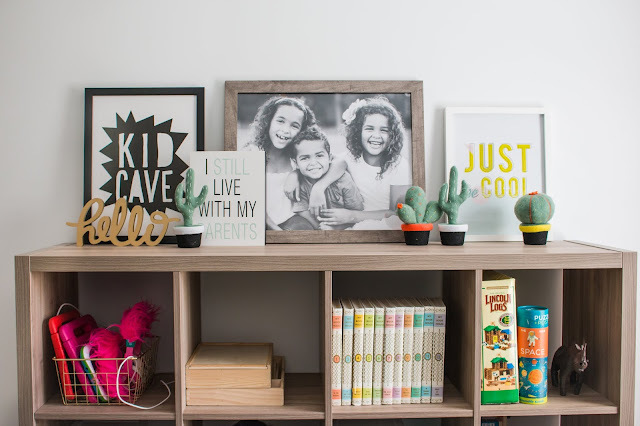 The office, playroom, and bathroom are separate but the kitchen, living room, and what the builder calls "everyday eating" are all one space. I'm eager to add rugs, drapes, accent furniture, and wall treatments to differentiate one space from the other. But first. Paint. 1. Our living area doesn't get much natural light. 2. The grayish floors have a cool brown tone. 3. The builder's paint was giving every swatch I put up, a neon hue. 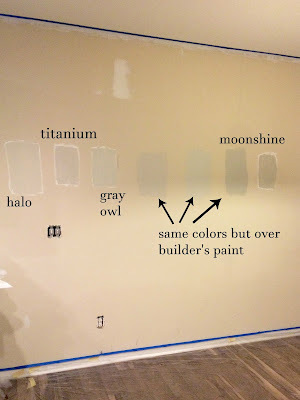 Slowly, my dream of Benjamin Moore Gray Owl become more of a nightmare. The drama right? Luckily one of my best friends is an amazing interior designer and offered other suggestions that might work in the space. 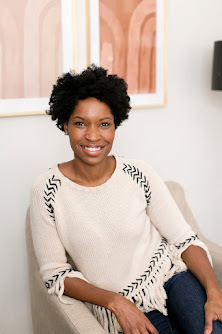 She helped me choose Dax's nursery wall color which I adored so I trust her gut rather than my own (the girl who painted her first kitchen lime green). Finally I went with Abby's initial suggestion which was Benjamin Moore Halo (color matched at Home Depot). It's almost white. I usually like cool, not warm and bold, not subtle. 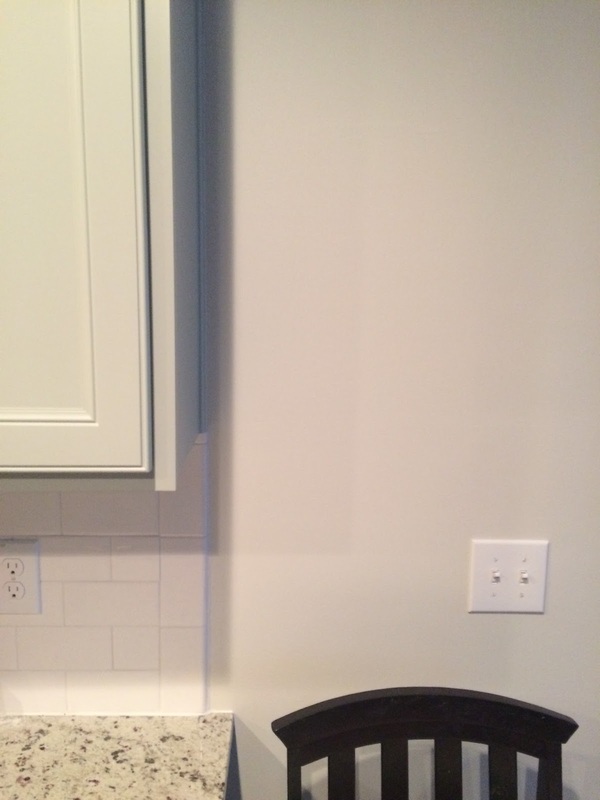 But this color is perfect for the space. It compliments the cabinets rather than bringing out the green, it looks great with the floors, and it's light and bright which is helpful with the lack of natural light. I think the gray furniture will complement it beautifully. After an initial freak out that went something like "We spent 4 days painting our entire first floor beige!" and "Does this even look different than the builders paint?!" and "Did I seriously just paint my walls white?!" I'm in love. Painting brings out the drama queen in me. I could go on and on about my quest for the perfect gray sofa but I've already exhausted my word count with the paint drama. So suffice it to say Abby and my friend Jessica deserve medals for helping me work through that decision-- i.e. answering and receiving a gajillion texts complete with photos, specs, and jubilation intertwined with panic. On paper, I'm in love. This is the plan Abby whipped up for us. I love it so much. The only reason we might go off grid, is if I come across a piece I love at a great price. When it comes to decorating I have two personalities. Abby nailed one with this plan. But the other is a bit more modern. I love that the big pieces of furniture can go either way so time will tell if we lean rustic like her plan or modern (with a hint of glam) like some of my inspiration images. I should probably just stick to the plan. 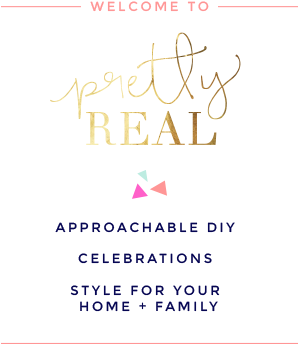 PS- I could totally get used to working with a designer. Yikes. Sofa. Lamps (similar). Drum table (similar). Side table. Woven Basket (similar). large arm chairs. Poufs (similar). Sofa Table (similar). Jute Rug (similar). What do you think? 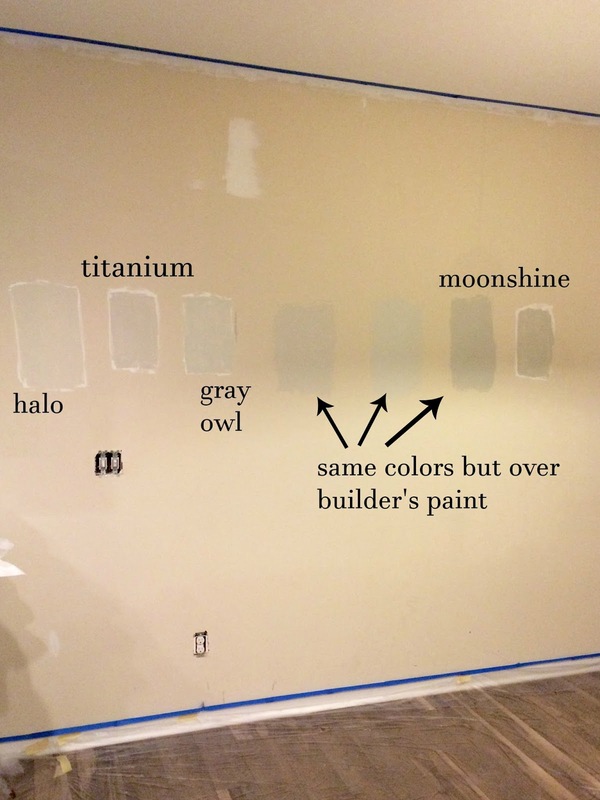 Are you any good at choosing paint colors? Do you turn into a daytime soap star at the mere mention of paint? No? Just me? Love those gray chairs. And that flooring, omg. Love. thank you! the gray chairs came in and they are so lovely in person! Tiffany your floors!! 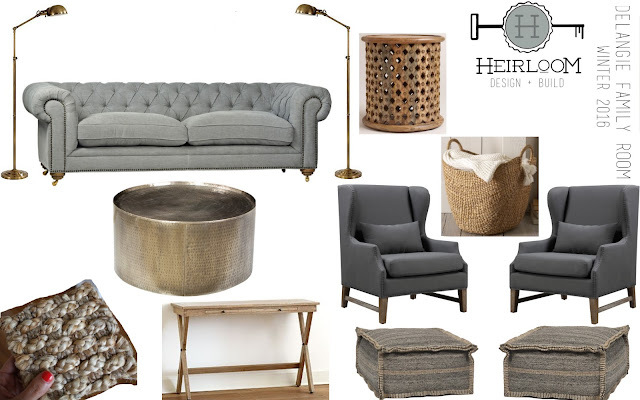 And I love the couch ideas.. can't wait to see the finished product!! Thank you! We love the floors! Will definitely update you all when the room is finished! Are the floors the Mannington Antique Maple Dusk?? Do they have a glossy/smooth finish on them? I think I was looking at these today but the glossy finish scared me. Have you had any problems with it?? Thank you SO much for any helpful info! LOVE the floors! Yes they are Jessica! I'd describe them as matte. I've had shiny floors before and these aren't shiny or glossy but do have a subtle sheen and very subtle texture to them. You can see footprints on them from time to time but it's not too bad. 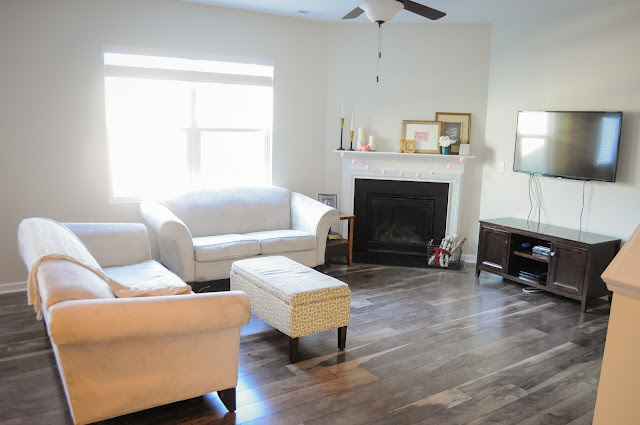 My last home had shiny/glossy laminate and it was a nightmare! The medium tone on these plus the matte finish make them livable. Thanks Elaina! I love anything turquoise or aqua too! I find myself using it whenever I decorate the kids' rooms or throw them a party. And yes to the stress! lol! I have a love/hate relationship with decorating!